When the first teaser trailer for Danny Boyle's 127 Hours came online back in August, it took everyone by surprise. When talking about the film, most people referenced the story of Aron Ralston being trapped under a rock and cutting off his own hand to survive. The first look, however, had an entirely different tone for 90% of its run-time, showing Ralston, played by James Franco, as a fun loving character flirting with two girls he finds out on the mountain. While the newest trailer shows some of that as well, it's a much better representation of the film's tone. Apple has released the newest look at the film and it looks just as stunning as Katey said it would be at this year's Toronto International Film Festival. While the video opens with the same fun tone as the first spot, Franco talking into his camcorder, saying hello to the world. Things change dramatically, however, when you realize that he's maintaining this attitude while his right hand is pinned by a boulder. Note the hour glass shape made by the rocks. Time is running out for Aaron Rolston. 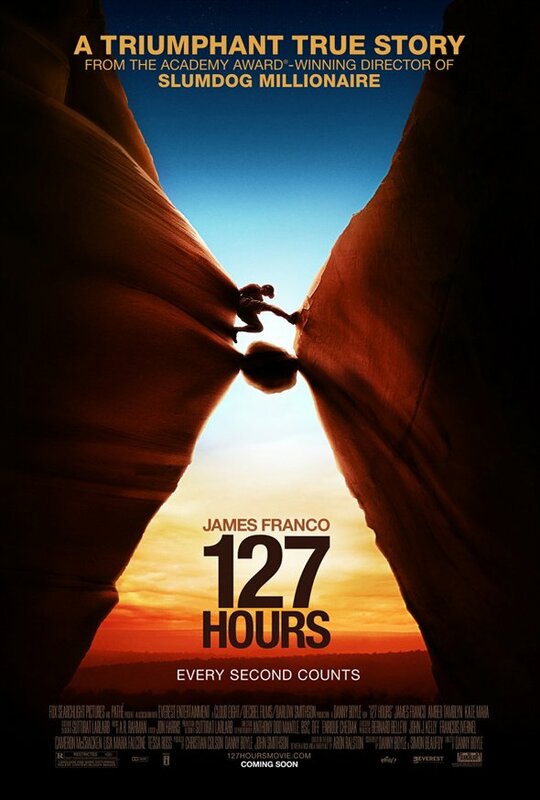 For more on 127 Hours visit our complete preview page here.